Lila and I saw this temple on our first walk in Singapore, the evening of our arrival in April 2009. 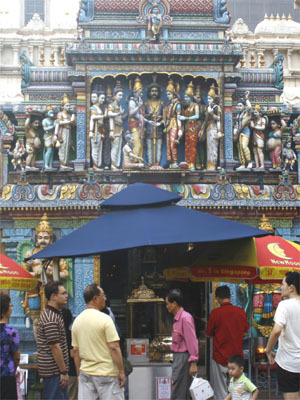 This was our introduction to several stunning Hindu temples in the city-state. A sign nearby informed us that, although the temple began over 130 years ago as a shrine to Lord Krishna under a banyan tree, with major developments continuing through the decades, the main entrance--of which these images are a part--dates only to 1987. The first picture (by Lila) shows the gateway, with vendors set up right in front. You can just see one guardian's head peeking over the left tip of the umbrella. The guardian on the right is Lord Hanuman, the famed monkey warrior of the Indian epic Ramayana. 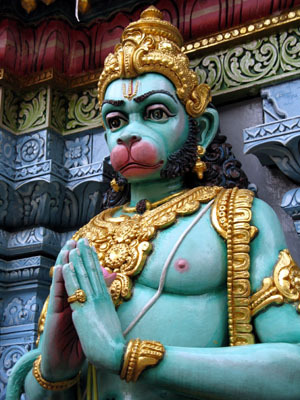 Some say Hanuman was the model for the monkey king Sun Wukong in the Chinese epic "Xi You Ji" (Journey to the West). The figure on the left gave us a little trouble, until a passerby told us he was the eagle-man Lord Garuda. When we heard that, we had a "doh!" moment, as the giant wings and manifest beak should have been a dead giveaway. See the cobra around his neck? He has a close association with serpents, his mother being the sister of Kadru, "mother of serpents." 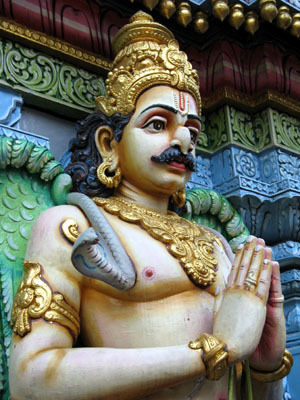 A look at the Wikipedia article will show several stories about Garuda and serpents. This association of serpent and eagle is nearly universal (see the eagle holding the serpent on the Mexican flag, for example). The serpent represents earth (it crawls on its belly), and the eagle heaven, where eagles soar. These two were fitting guides to introduce us to several days oftemple-crawling.